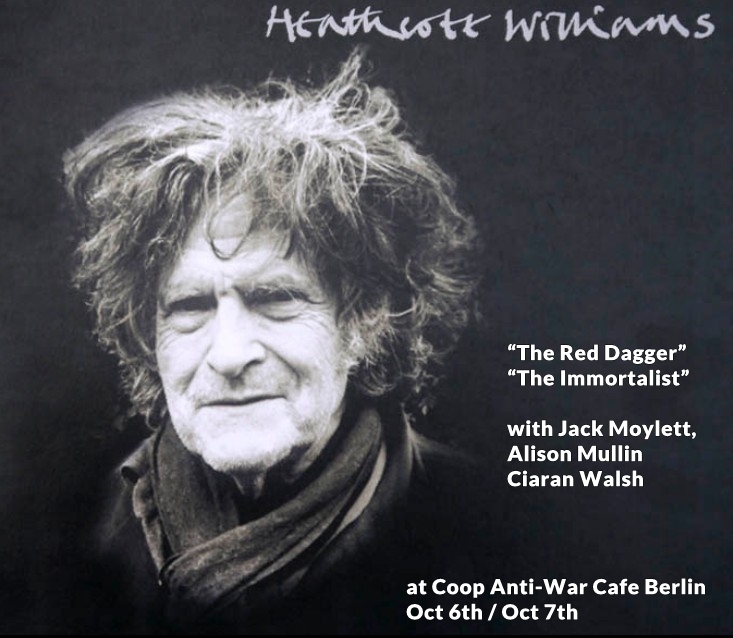 Two English Language performances inspired by literary wizard Heathcote Williams, best–selling poet, critically acclaimed playwright, award winning author, accomplished actor and celebrated activist who pioneered the investigational prose poem and uses this medium to tackle a variety of political and environmental issues. Ciaran Walsh is performing “The Red Dagger” by Heathcote Williams which tells the story of the City of London’s symbolic coat of arms, an image of the blood red dagger that killed Wat Tyler, and which casts an eye on the City’s corruption from the time of the Peasants’ Revolt to the present day. A play on the nature of time, ageing and death: a sceptical TV reporter interviews a 278 year old man about time itself and the alternative to death. The Immortalist argues against passivity: “people foul up because they stay in the same place. They’ve traded utopia for reality, they’ve traded their instinct for politics. Consuming is a substitute for being. TV is a substitute for astral projection. Aeroplanes are a substitute for levitation”.